However, observing Independence Day only became commonplace after the War of 1812. Soon, events such as groundbreaking ceremonies for the Erie Canal and the Baltimore and Ohio Railroad were scheduled to coincide with July 4th festivities. 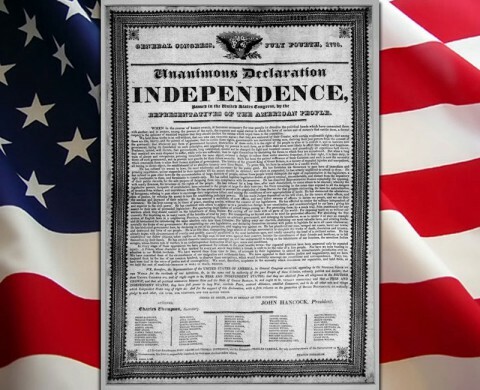 In 1859, the Banneker Institute of Philadelphia, Pennsylvania, urged African Americans to celebrate Independence Day while bearing witness to the inconsistencies between the ideals espoused in the Declaration of Independence and the practice of slavery. We have learned by experience and by the comparison of ourselves with people similarly situated, to hope that, at some day not very far in futurity, our grievances will be redressed, that our long lost rights will be restored to us, and that, in the full stature of men, we will stand up, and with our once cruel opponents and oppressors rejoice in the Declaration of our common country, and hail with them the approach of the glorious natal day of the Great Republic. Banneker Institute, July 4th, 1859. By the 1870s, the Fourth of July was the most important secular holiday on the calendar. Congress passed a law making Independence Day a federal holiday on June 28th, 1870. Even far-flung communities on the western frontier managed to congregate on Independence Day. There would be floats in the morning and the one that got the [girls?] eye was the Goddess of Liberty. She was supposed to be the most wholesome and prettiest girl in the countryside — if she wasn’t she had friends who thought she was. But the rest of us weren’t always in agreement on that…Following the float would be the Oregon Agricultural College cadets, and some kind of a band. Sometimes there would be political effigies. Just before lunch – and we’d always hold lunch up for an hour – some Senator or lawyer would speak. These speeches always had one pattern. First the speaker would challenge England to a fight and berate the King and say that he was a skunk. This was known as twisting the lion’s tail. Then the next theme was that any one could find freedom and liberty on our shores. The speaker would invite those who were heavy laden in other lands to come to us and find peace. The speeches were pretty fiery and by that time the men who drank got into fights and called each other Englishmen. In the afternoon we had what we called the ‘plug uglies’ — funny floats and clowns who took off on the political subjects of the day…The Fourth was the day of the year that really counted then. Christmas wasn’t much; a Church tree or something, but no one twisted the lion’s tail. Walker Winslow, interviewer, December 15th, 1938. The Fourth of July was observed at Caldwell Cross Roads. The military companies of infantry would assembly here from the surrounding counties making up a brigade. A drill and inspection were had, and a dress parade followed. There was an old cannon mounted on the field. The honor of firing it was assigned to Hugh Reed, who had been in the artillery of Napoleon’s army at Waterloo and afterward emigrated to South Carolina. A great barbecue and picnic dinner would be served; candidates for military, state, and national offices would speak; hard liquor would flow; and each section would present its ‘bully of the woods’ in a contest for champion in a fist and skull fight. Butting, biting, eye gouging, kicking, and blows below the belt were barred. It was primitive prize fighting. The Library of Congress posts a wealth of online information pertaining to the Declaration of Independence and its principal author, Thomas Jefferson. Declaring Independence: Drafting the Documents, provides a Chronology of Events leading up to the revolution and a fragment of an early draft of the Declaration. Also, see The Thomas Jefferson Papers at the Library of Congress which includes a Thomas Jefferson Timeline. A Century of Lawmaking for a New Nation: U.S. Congressional Documents and Debates, 1774-1875 contains congressional information concerning the Declaration of Independence in the Journals of the Continental Congress and the Letters of Delegates to Congress. Pioneering the Upper Midwest: Books from Michigan, Minnesota, and Wisconsin, ca. 1820-1910 contains wonderful Independence Day recollections. Search the full text option on Fourth of July to locate many descriptions of the holiday including “Celebrating The Fourth,” a chapter of Lewis Reimann’s Between the Iron and the Pine: A Biography of A Pioneer Family and A Pioneer Town . Turn to The Northern Great Plains, 1880-1920: Photographs from the Fred Hultstrand and F.A. Pazandak Photograph Collections for images of Independence Days past. Search the collection on Fourth of July to find photographs like Gathering at the School House for a Fourth of July Celebration . Learn a new Independence Day song like “Huzza! ‘Tis the Fourth of July!” from Music for the Nation: American Sheet Music, 1820-1860 & 1870-1885 or “Up With the Flag,” available in Historic American Sheet Music, 1850-1920. Search these collections on Fourth of July. The Stanley Heirs Park was formed by descendants of nineteenth-century settlers who farmed and worked in the West Virginia mines. Search on the term Fourth of July in Tending the Commons: Folklife and Landscape in Southern West Virginia to see images of the Stanley Heirs celebrating the Fourth. See, for example, Charles Lilly playing the bass guitar, or Larry Gibson speaking with Mary Hufford. Abigail Adams, African-Americans, Banneker Institute of Philadelphia, Christmas, Congress, Constitution, Continental Congress, Declaration of Independence, England, Erie Canal, Fourth of July, Great Britain, Independence Day, Jacob C. White Jr., John Adams, July 4th, Library of Congress, Nettie Spencer, Oregon, Pennsylvania, Portland OR, Samuel B. Lathan, slavery, South Carolina, United States, War of 1812, washington d.c.